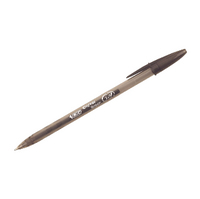 Bic Cristal Gel Ball Pen. The world-renowned classic pen now with gel ink! Ultra smooth writing with a tinted barrel to match ink colour and stylish chrome nose. Medium line width - 0.8mm. Ink colour - Black. Approx Dimensions (CM): D15.9 W5.7 H4.6. Approx Weight (KG):0.1301.